The Wilson Center’s Michael Kugelman recently spoke to Circle of Blue about the dangerous flare up between these long-time rivals and the prospects for the Indus Waters Treaty going forward. For more, read or listen to the full interview at Circle of Blue. Sources: Circle of Blue, Foreign Policy. Audio Credit: Circle of Blue. 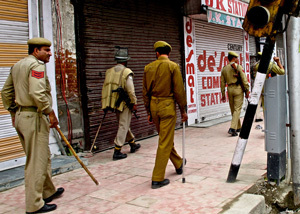 Cover Photo: Indian police patrol Srinagar, Kashmir, June 2010, courtesy of flickr user Austin Yoder.